I go to the 25-cent-a-gallon water store because I am far too superior a person to drink water from those little plastic bottles and wreck the environment BECAUSE I CARE ABOUT THE CHILDREN, unlike some of you people. 2. I always have 10 gallons of water on hand in case of earthquake. It’s California, people. So there I am, waiting for this woman to get done filling her bottles and she has all different sizes and shapes, quite a few bottles. She’s shuttling them back and forth to the car and I’m just standing there, not even sighing or rolling my eyes even though she is taking forever, because I’m really cool like that. She turns to me with Eyes of Fury® and says in a menacing Eastern European kind of accent “Yes. Yes. NOW I am done.” She gets in her car and slams the door, hard. One of the most maddening things in life is to make an offer in kindness, and have the receiver assume it is malicious. Some of the biggest fights I have had with exes were over this. I thought I was buying the right kind of toilet paper because my kind was cheap and lasted a long time and he thought I was being an inconsiderate jerk and trying to exfoliate his tenderest parts with cardboardy toilet paper, so we ended up screaming at each other in the supermarket parking lot. Nice. Flip the coin over and assume innocence. Offer some lilies instead of thorns. Just maybe the PTA moms were trying to reduce the time burden on women they knew were pressed for time? Wouldn’t that be better? Assuming that people are behaving from innocence is a good way to live because you’ll be right about 95% of the time and people appreciate it if they see you seeing them in a good light. You might get fooled every once in a while, but hopefully your Spidey sense will kick in at those rare moments. Thorns or lilies? Take your pick. PS Only I can incorporate toilet paper into a Deep Spiritual Lesson®. Also? I know those are irises, not lilies, but those are pretty ones, huh? I bought the tubers for my mom and she made them grow. I totally get what you are saying, and I fail at the kindness thing more times than not. I suscribe to the rule “Don’t take anything personally” and it works. The trouble is that my brain doesn’t instantly remember this rule. I’m trying to get my brain to remember it BEFORE I assume the person behind me in the taco line isn’t intentionally hitting me with her purse. Lillies is a nice way to live. I’ve only recently learned to do it the majority of the time. Now, if we can’t just make our fellow socalians learn it too…. People are generally so grateful when you see them as innocent, struggling beings. We all like to be given the benefit of the doubt. I’m having a rather crabby morning and really needed to read this. I am going to try very hard to keep this lesson in mind until my attitude improves. When the student is ready, the teacher appears. Or something. I am a big fan of assuming the best possible motive consistent with the facts you have. It makes a big difference in the assumer’s attitude as well as relationships. Actually I think this is one of the very big elements in a good marriage and good relationships with one’s children. And if you can’t bring yourself to actually believe the best, it’s often helpful to -act- as if you believe the best about someone. It’s a much nicer way to ask someone to do something and you’re much more likely to get them to do what you want -and- retain a good relationship. Even if you secretly think they are just being mean/lazy/spiteful. also? i LOVE those iris!! what variety are they? i must have some. so now you’re moderating me? what’d i say?? Not as far as I know. I don’t think you CAN be moderated LOL. and no, i’m not easily moderated. bwahahahaha! 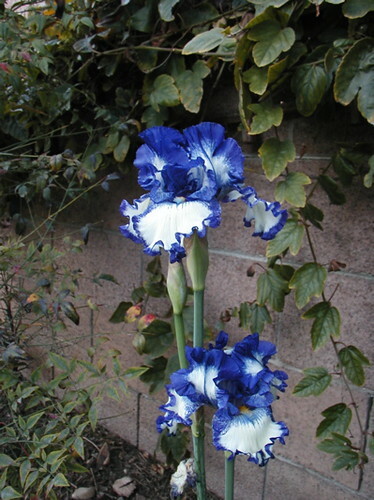 I have never seen blue bearded irises before. Magnificent. I hate to spoil the illusion, but in real life they are more purple. I don’t know what happened in the photo. Very nice post. I agree, and I think I usually do a pretty good job at giving lilies, and even awesome irises like these. Although. Sometimes, when I feel especially wronged, I give the silent treatment along with a block of ice. That’s almost as bad as thorns, I know. Okay. I need to go think about all this now! Oh, I can passive-aggressive with the best of them too! Such a good lesson. I can’t hear/read it enough. And irises and lilies are my favourites! There was a place up in San Luis Obispo county that had hundreds of varieties of Irises in all different colors from pure white to solid black. It was amazing to visit during bloom time. Big, huge lesson I’m trying to keep in mind when dealing with my sibling. We are both so quick to assume the other meant ill. Thanks for the reminder. You’re welcome. The more reminders the better, because I forget all the time, too. Catching up on some reading… I really needed to hear this – today the eve of a new year. Thanks!